Fry the bacon on medium heat till nice and crispy. Add the tomatoes, some black pepper and a little water. Stir and leave to simmer for 5-10 mins to infuse tomatoes with bacon flavour. Finely dice the onions and fry in the small frying pan until soft, using 1 Tbsp of the olive oil. Seperate mince strands and place in the large mixing bowl. Add breadcrumbs, herbs, black pepper to taste and paprika (if using). Drain softened onions in the sieve and add to the mixture. Beat egg in the small mixing bowl. Add egg slowly to mixture and continue to mix with your hands until all is well combined. 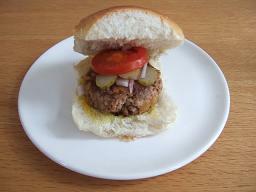 Split into 4 and shape into patties. 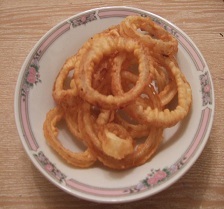 Fry in the large frying pan using the remaining olive oil until brown both sides. Place in the rolls and add garnish of your choice. Gently fry the garlic for 1 minute in the olive oil. Add mushrooms to the frying pan with the mixed herbs and fry with a lid on for 5-10 minutes turning occasionally. Meanwhile, grill the bottom of the crumpets until nice and crisp. 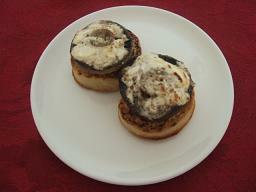 Turn the crumpets over and lightly grill the top. Place 1 mushroom on each crumpet, gills upwards. Spoon a little of the garlic juice into each mushroom. Spread the cream cheese over each mushroom. Grind a little pepper over the cheese and return to the grill. Grill for a further 5 minutes or until the cheese has started to brown a little. Pre-heat oven to 220°c / 425°f / Gas Mark 7. Peel and finely chop the onions and place in the mixing bowl. Peel and finely dice potatoes and add to bowl. Peel and finely dice garlic and add to bowl. Add minced beef, herbs and pepper and crumble in stock cube. Mix together using your hands..
Cut pastry into four equal portions. Roll out one portion to the approximate size of your plate. Place the plate upside down on the pastry and cut around the plate. Pile a quarter of the meat mixture in the centre of the pastry and dampen all around the edge with water. Lift the sides of the pastry up to the middle and press the edges together to make the Pastie shape. Place on a baking sheet and brush with beaten egg. Repeat the above steps until you have 4 Pasties. Place in the centre of the oven for 20 minutes. 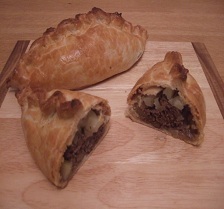 These are big pasties and can be served with chips or veg as a main. You can make these in advance and refrigerate or freeze for later use. Cut the ends of the french stick and cut into 4. Slice each piece of french stick down the middle so you now have 8 slices. 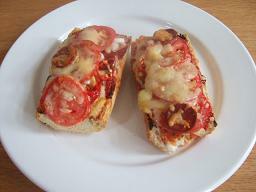 Squeeze some tomato puree onto each slice of bread and spread to cover the base. Slice onions thinly and put on slices. Cover slices with about half the cheese. 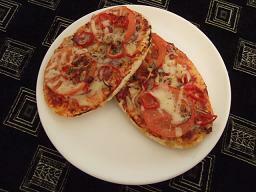 Slice tomatoes thinly and put on top (2-3 slices per pizza). Sprinkle the Italian seasoning and Oregano over the pizzas. Add any other toppings of your choice. Put the rest of the cheese on top of the pizzas. Add some black pepper to each pizza. Drizzle each pizza with a little olive oil to keep the pizzas moist. Place on Grill tray and cook in middle of oven for 15-20 minutes. We use about 30g/1oz of cheese per pizza so adjust this amount per pizza you are making. Place the flour, salt and yeast in a large mixing bowl and mix together. Add the oil and stir in. Add the warm water a little at a time until you have a soft dough. Place dough on a floured surface and knead for 5 minutes until the dough is smooth. Place in large bowl and cover with oiled clingfilm. Leave the dough in a warm place for about an hour, or until it has doubled in size. Preheat oven to 230ºC/450ºF/Gas Mark 8. Skin and de-seed 2 tomatoes. 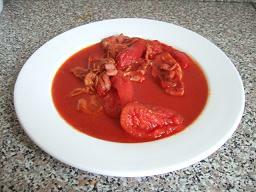 Finely chop the flesh and place in a bowl with the tomato puree and herbs. Peel and crush the garlic and add to the tomatoes with some black pepper. Sprinkle a layer of coarse semolina onto the baking sheets (this will make the base lovely and crispy). 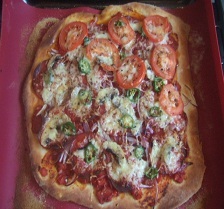 Divide the pizza in two and roll out into square or round shapes approximately 18cm / 9”. Place the rolled out dough over the semolina. Finely slice the onions, tomatoes, mushrooms and chilli if using. Arrange the toppings on the pizzas, saving the cheese until last. Finish with a little more black pepper. Place one pizza on the top shelf of the oven and one on the lowest shelf. Cook for 5-6 minutes then swap them over. Keep checking and if needed, swap again. You can use as many toppings as you like as the crust is so thin and light. Squeeze some tomato puree onto each pitta bread and spread to cover the base. Slice onions thinly and put on bases. Cover bases with about half the cheese. Pre-heat oven to 170°c / Gas Mark 3. Put butter, sugar, and syrup into saucepan and melt together over a medium heat. 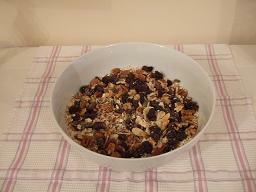 Add oats, and seeds and stir well. Pour into baking tin lined with baking paper. Bake in top half of oven for 30-40 minutes or until golden brown. Remove from oven and cut into slices while warm. Store in an airtight container for later use. Place a layer of tortilla chips in the bottom of the roasting dish using half of the chips. Sprinkle half of the salsa over the top. 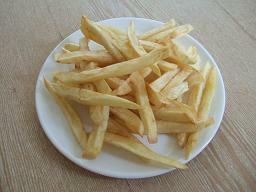 Spread the remaining chips on top. Sprinkle the remaining salsa over this. 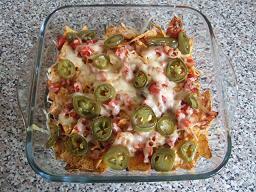 Sprinkle cheese over the top of the salsa and arrange jalapenos on top. 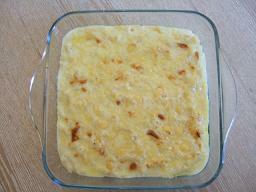 Place in the top of the oven for 10-15 minutes or until the cheese has melted and started to brown. Serve with Guacamole and soured cream. Sift the flour into the large mixing bowl through a sieve held high above the bowl to aerate the flour. Make a hole in the centre of the flour and break the eggs into it. Whisk the flour and eggs together. 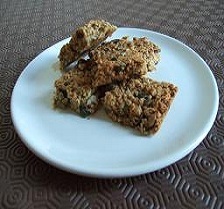 Gradually add small quantities of the milk to the bowl while continuously whisking the batter mixture. When all the milk is added whisk until the batter is smooth. Heat the frying pan and add a knob of butter, tipping the pan to coat the base totally. Add about half a soup ladle of batter for each pancake. When the pancake loosens at the sides flip it with the spatula and cook the other side. 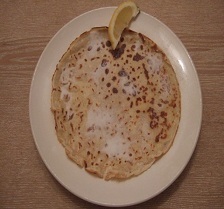 Squeeze some lemon over the pancake and sprinkle with caster sugar and serve immediately.